Built at York in 1940 (on an order placed in 1939) it was seven built that year to a standard Gresley design. Used on main line passenger trains all over the LNER system it was renumbered 16520 in 1956 and continued in service until the early sixties. Unlike many of our other vehicles this one did not get converted to a departmental vehicle, but instead went straight into preseravation on the Worth Valley Railway. Used for many years (as their number 11) it even starred in the original "Railway Children" as the "Scotch Express". 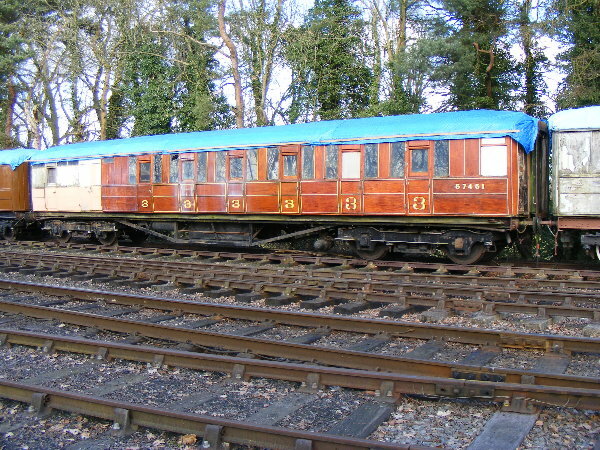 It left the Worth Valley in 1975, was purchased by RVP and appeared at Loughborough in 1981. Stored for many years, it received cosmetic attention in 1986 for a filming contract, and again in 2000 (when it was repainted Blood & Custard livery). Stored in the open since it deteriorated and, in 2007, it recieved further attention and now carries a scrumbled teak finish. It does remain relatively complete and restoration to varnished teak will be relatively straightforward.